I would hold off on the top dress for a while. Soil temps need to be much higher before it will really start to grow enough to push thru a top dress. Give it some food if you can, the yellow blades in the last pic with the soil plugs tell me it's hungry. I mowed mine today with my new push mower just to clean it up a bit. The long wide blade growth is most likely annual rye grass. Keep mowing low and it will die off. Where is this field? I want to head down to Haggens to pick up some wonderful American beef, i'd love to drive by and check it out. @Shindoman Thanks that's good advice. Their first home game is not until the end of March, so I'll hold off on the top dress and hopefully still get it done in time. I'm getting the soil samples to the lab this week, then I'll have some data to go off of for feeding. Haggen has great meat! I still buy beef there sometimes, but I've really fallen for the Prime Beef at Costco. It's dynamite. The field is at Ferndale High School, about 15 minutes south of the Peace Arch Border Crossing down I-5. If you make it down this way, feel free to shoot me a message and I can give you the tour! 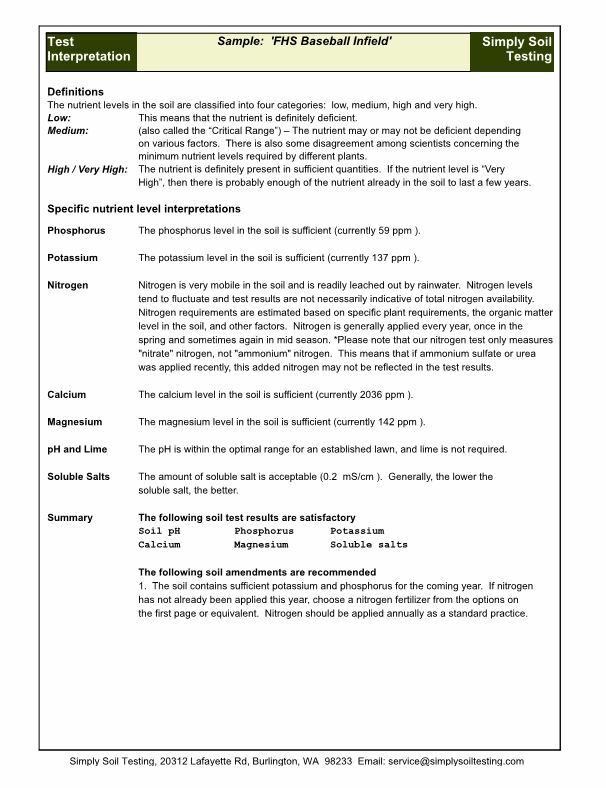 Nitrogen looks low - The second page clarifies that any Urea that was applied, may not be reflected in the test results. I had applied Urea last fall (Nitrogen Blitz) so I'm not sure if this needs to be taken into consideration. The pH, Major and Secondary nutrients are in good shape. 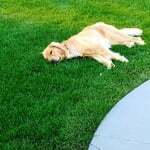 Any issues would most likely be attributable to the micros (untested), disease, irrigation or mowing. So far, so good. Ca and Mg are fine. Sufficient reserves of P and K are present to allow for just maintenance fertilizer application. P levels are actually above common target level of 50ish ppm, so P could be skipped for the next growing season. If you elect to add any, I would suggest only 0.5 lb/M of P2O5 total for the season. Suggested maintenance amounts for K is to add 0.5 to 1;b?M of K2O for every pound of N applied. Suggest 1 lb/M of K2O for every pound of N applied. Test P and K next year and adjust future application rates based on the results. Soil N is pretty transient. 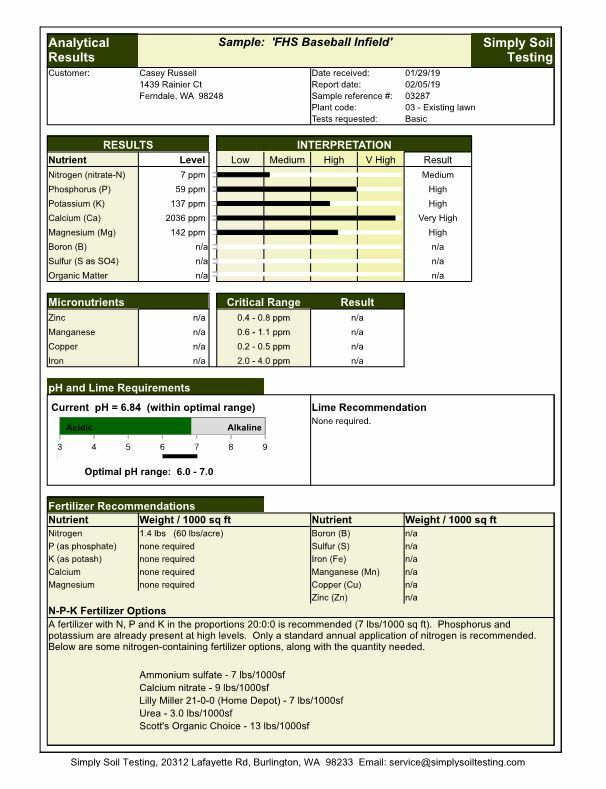 Recommended level is about 20ish ppm for total N with Nitrate N to Ammonium N levels at 2:1 ratio or greater. Yes, it does take time for urea to become (action of urease enzyme) ammonium and then more time for ammonium to become (action of microbial activity) Nitrate. My above "analysis" was based on the assumption that the test was M3. I just noticed that Lab was Simply Soil Testing. The do use M3 for Ca, Mg and K BUT they use Bray P1 for pH <7 soils and Olsen for pH >7 soils. Recommended sufficiency levels for Bray P1 is 15-30, 59 is about twice sufficiency. I would suggest you not add any P this next season, retest next year (Feb) and observe any changes in P to determine future needs. Last edited by Ridgerunner on Tue Feb 05, 2019 6:54 pm, edited 2 times in total. @Ridgerunner Thank you so much! That's the beauty of TLF. You have someone like @Ridgerunnersharing his knowledge. Just placed an order with Hancock Seed - Have two varieties coming. 1.) 50# KBG Midnight - I wasn't sure I wanted to pull the trigger on KBG, since my intent is to do an early Spring overseed which as most people know carries a low success rate. After some deliberation, I decided the risk was worth the reward. KBG is an ideal playing surface, and I will try to best set myself up for success to get this established. Worst case, I've wasted some seed but I'll have enough to try again in the fall. 2.) 50# Champion GQ PRG - I've used this seed before with good results. This will be my "go-to" for periodic overseeding throughout the season, and for high traffic areas. While I'm sure the success rate of mid-season overseeding is also low, this appears to be common practice for sports fields. 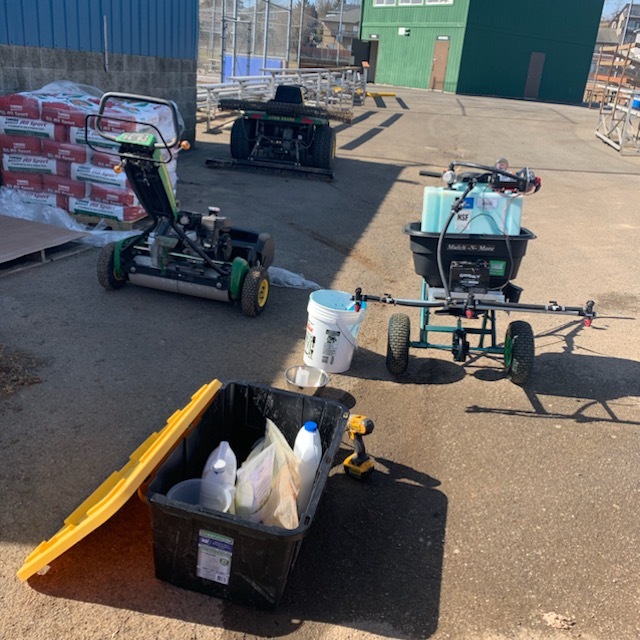 Ran low on these items after last season, I'm still stocked up on Tenacity, Prodiamine, Plant Growth Regulator, and an assortment of other herbicides. My 100 lbs of seed has shipped from Hancock. I have new blades ready to go on my slit seeder/verticutter. We had a snow episode here which is still evident, but growing season is close, I can feel it! I hope those kids come to understand how much love is being put into their field. I'm excited to see your progress! Looks like you are well prepared. When is this snow and cold thing going to stop? Field is getting prepped - First home game is March 20th. 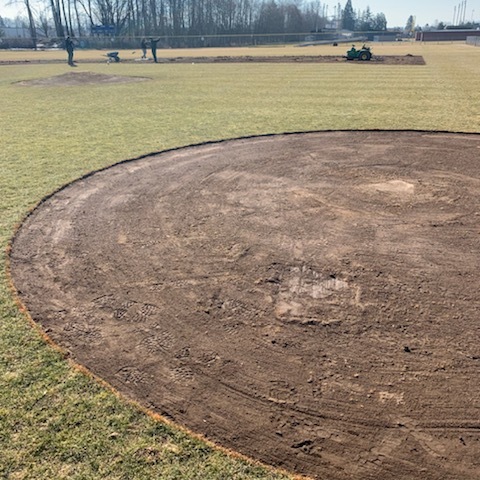 This weekend the pitchers mound was rebuilt, and the skins were edged and raked. 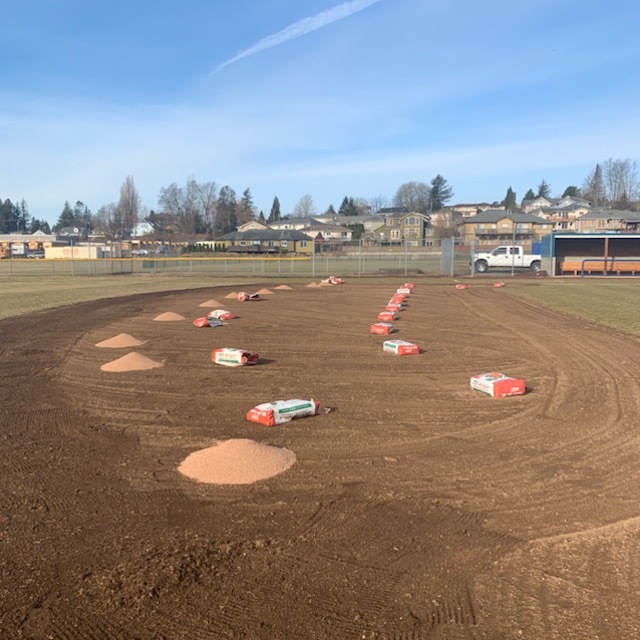 I won't begin to take credit for this, fortunate to have a few key parents who have donated their time and resources to the field as well, they did a great job. These dads are the same two guys that regraded the field and installed the irrigation system in 2017. One of them happens to own a John Deere 1200A Bunker Rake which he is nice enough to loan us. That thing is awesome! I want one for myself! We ended yesterday with a lot of work still left to be done. 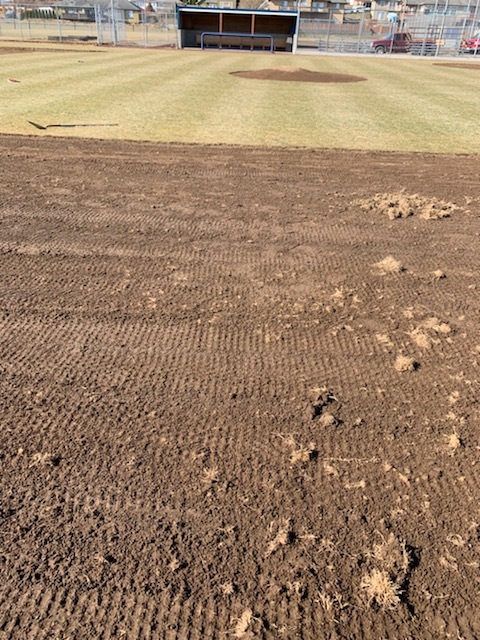 Lot's of weeds still need to be removed, the entire infield skin needs grading, and the turface material needs to be placed and dragged. All work that will be wrapped up in the next week or so. Now on to the grass - I had high hopes of maybe mowing yesterday, but we just haven't had the conditions. Since mowing in January, we were hit with a really nasty February. Snow, cold, dry windy conditions have really scorched everything around here, including lawns and golf courses. We should start to see some temps near 60f coming in the next week, so hoping things start to make a turn for better! I will plan on mowing and doing an early spray app this weekend of FAS + Humic Acid + Blue Dye. I want to wake the grass up, hoping this should kickstart things! 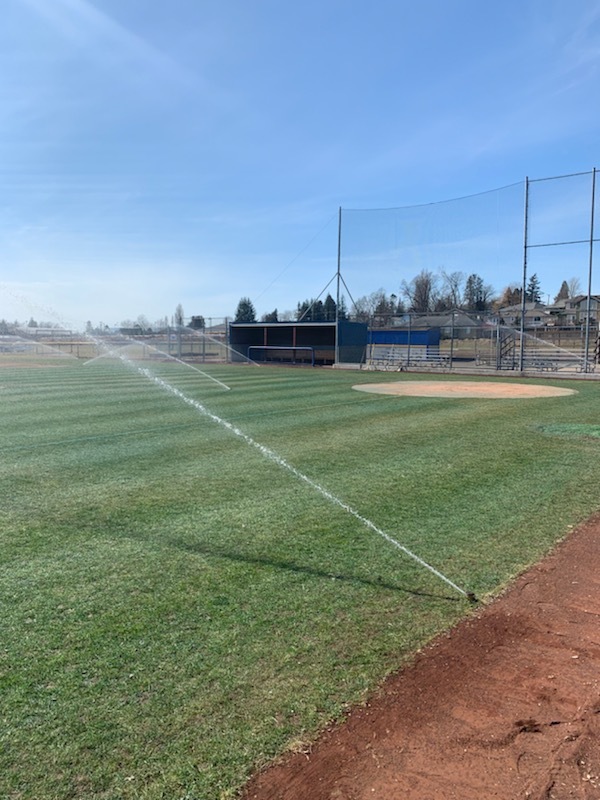 I do not want to use Pre-Em this year as I don't want to rule out Spring and mid-season overseeding, however I may put down Pre-Em on the infield skin before the turface. Maybe consider using germination friendly pre? Could do a spaced out 4 apps by rotating tenacity and ethofumesate. Then use a post as needed which is seeding friendly like quinclorac. Of course, read all labels and time spray and seed as directed. Which pre-m on the skin? Be careful as nail dragging will break the barrier. Currently, the only Pre-M's in my supply are Tenacity and Prodiamine. I was planning on using Prodiamine on the skin, not to say that I am against buying something else. Also I don't think that we have a nail drag (yet) so this might not be a big concern for now. This skin maintenance is very new to me... I should probably just stay in my lane and focus on the turf, while the others take care of the skin but I also can't help but try and get educated so that I can contribute to the effort as well. @crussell Do you think there would be any chance of staining uniforms with a yellow product being put down on the skin? Ha that hadn't crossed my mind, but I dont think so... Anywhere that is sprayed would get covered with Turface. I did consider that my spray apps on the turf might turn some cleats/uni's blue from the dye. though. A lot of moving parts today, but things came together and we are ready to go! 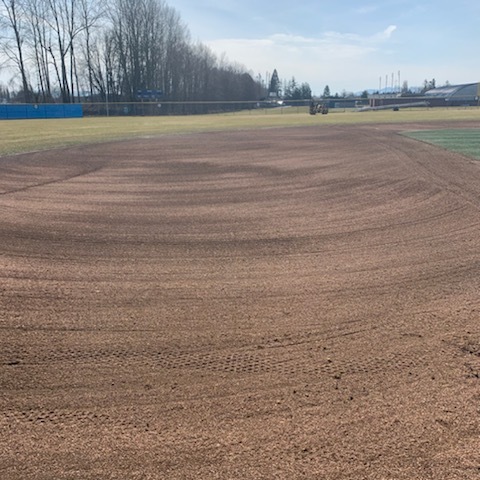 *Finish cleaning up the infield skin, including edging, weed removal, and grading. Weather is in the 50's & 60's for the next few days, should start to POP! Looked a lot better after my spray app, a little blue marker dye really improved the color haha. First game is Wednesday. I'll be double cutting Tuesday evening. Double cut the infield after work yesterday - Forgot to take a picture. Pictures! How is it holding up with games being played on it now? I noticed you used the extreme blend from Kelp4Less, how do you like it?